Manuia Maunupau, old-time Kona fisherman, passes away, 1940. A famous old-time Hawaiian fisherman, one who taught Island royalty the art, will be laid to rest here this afternoon when Manuia Maunupau of Kailua, Kona, is buried. Mr. Maunupau died Sunday night at the home of his son, Thomas K. Maunupau, 3326 Hoolulu street, after an illness of three months. He was 68 years old and had come to Honolulu in February for medical treatment. Funeral services will be held at 2 p.m. today at Silva’s mortuary, where the body has been on view since last night. Interment will take place Puea cemetery. It was from his father, Maihui, that he learned the various methods of fishing. He knew the names and location of the koas or fishing grounds, particularly those surrounding the area know as Haleohi’u, “the house of many fish tails,” which is located between Keahole Point and Kuhio. Mr. Maunupau knew the landmarks of these fishing grounds: their characteristics, such as depth, current and the kinds of fish that are found there. He knew the stars, current and the winds.He knew every rock and reef offshore and could steer a canoe or boat blindfolded along the west coast of Hawaii. For a short time, Manuia Maunupau was a mate on a schooner owned by George McDougall, who was then doing business in Kailua, Hawaii, more than 40 years ago, and which ran between West Hawaii ports and Honolulu. The Honolulu Advertiser, 84th Year, Number 19,145, Page 1. March 26, 1940. More on the death of Keanu, 1902. Shortly after 8 o’clock yesterday morning the body of Keanu, a high chiefess and reputed daughter of Kamehameha V, was found upon the beach at Waikiki, opposite the premises of the late Queen Dowager Kapiolani, now occupied by Princes David and Cupid. The woman had probably been dead about an hour when discovered, and her death is believed to have been due to apoplexy. She was well when she left the Dowager’s premises early in the morning. She wen across the roadway to the bathing beach, donned a muumuu and entered the water for a swim. Just how soon she was overcome is not known, but it is evident that she was upon the beach when the attack came. The fact which led to the belief of apoplexy was that the face was much discolored. There is nothing pointing to foul play and it is not believed that she was drowned. A jury was empanelled yesterday morning and the body viewed at the morgue. An inquest was to have been held last night at the police station but was postponed until this afternoon. Keanu was a woman of imposing appearance and always commanded the attention and respect of Hawaiians wherever she went. She had the manner and dignity of a chiefess of the royal blood and was looked upon by the natives generally as one to whom homage was due. She was a great friend of the late Princess Ruth and in later years was much with the late Queen Dowager. She has been residing on the premises at Pualeilani for several years and was protected by the two Princes, as well as by the Dowager before them. For some time past she had not been right in her mind. Several years ago her husband went away into the mountains and nothing more was heard of him. She leaves several children. At the breakfast and reception given by Queen Liliuokalani last year Keanu was among those who called and her appearance was much commented on at that time, for, believing herself fully entitled to respect and homage, she swept majestically along amongst the throng as if she were a reigning queen. Hawaiian Gazette, Volume XXXVII, Number 50, Page 4. July 1, 1902. Keanu, daughter of Kamehameha V and Keelikolani, passes, 1902. That Royal Descendant of the Land has Passed. KEANU DIES ON THE SHORE OF WAIKIKI. Right after 8 o’clock in the morning of Monday, June 30, the dead body of Keanu (f.) was found out near the residence of the Princes Kawananakoa and Kalanianaole at Waikiki. On that morning she was seen coming out of the Princes’ place, and went all the way to the ocean. There she put on her muumuu and went into the ocean. From here, that was all that was known of her until her body was found. It is believed that she had a stroke [ma’i huki] while in the water, and while being so afflicted, she could not help herself. Keanu was a chiefess, the daughter of Kamehameha V and Princess Ruth Keelikolani [Ruta], and it was he who housed her at Pualeilani, Waikiki, and it was there that she lived until this unfortunate accident. She had a regal stature, and she became an important presence in our chiefly circles. She fearlessly appeared at royal audiences with elegance, and some who had not seen her before thought she was an actual queen. Some time ago, her husband went into the mountains, and since then nothing was known of him. Keanu lived in sadness, and it was this that made her lose her senses. She left behind children who grieve in their love for her. How pitiful. Ka Nupepa Kuokoa, Buke XL, Helu 27, Aoao 1. Iulai 4, 1902. Royal Order of Kamehameha: the early days, 1903. The Secret Society of the True Natives. On the 11th of this month, on the day of Ka Na’i Aupuni [Kamehameha Day], a number of native youths established a secret society called “Kamehameha Order”. There are many respected Hawaiians who joined this association, and Prince Kalanianaole is the head of this group. It is stated that this association will be spread across this Archipelago, and native Hawaiians will be allowed to join, should they be fitting. One of their major functions will be trying to search out and to care for things from times of old, and the designating of the storied places [wahi pana] all over these islands. Currently, there is a Historical Society [Ahahui Moolelo o ke Au Kahiko]¹, and they have a lot, but the oiwi Hawaii themselves must do something so that the famed ones of times past will live on, and also to foster things that will let the name of Hawaii live on in perpetuity. “Ables, L. C.; Achi, W. C.; Alexander, S. T.; Alexander, W. D.; Allen, S. C.; Allen, W. F.; Baldwin, H. P.; Banning, B. R.; Beckwith, Rev. E. G.; Beckwith, Miss Martha; Bertram, Bro. G.; Bishop, Rev. S. E.; Bolte, C.; Bowen, W. A.; Boyd, J. H.; Brown, Cecil; Brown, C. A.; Bryan, Wm. A.; Carter, A. W.; Carter, G. R.; Carter, Mrs. H. A. P.; Carter, J. O.; Cartwright, Bruce; Castle, G. P.; Castle, J. B.; Castle, W. R.; Catton, R.; Cooke, A. F.; Cooke, C. M.; Cooke, Jos. P.; Cunha, E. S.; Damon, F. W.; Damon, S. M.; Day, Dr. F. R.; Dayton, D.; Desha, G. L.; Dickey, C. H.; Dickey, L. A.; Dillingham, B. F.; *Dimond, W. W.; Dole, E. P.; Dole, Hon. S. B.; Dowsett, J. M.; Emerson, J. S.; Emerson, Mrs. J. S.; Emerson, Dr. N. B.; Emerson, Rev. O. P.; Emmeluth, J.; Fisher, J. H.; Frear, Hon. W. F.; Giffard, W. M.; Goodale, W. W.; Graham, W. M.; Haalelea, Mrs. A. A.; Hackfeld, J. F.; Hall, W. W.; Hartwell, A. S.; Hatch, F. M.; Henriques, E.; Herrick, C. F.; Hobron, T. W.; Ho Fon; Humphreys, A. S.; Hustace, C.; Irwin, W. G.; Jones, P. C.; Judd, Albert F.; Lewers, Robert; Logan, D.; Lowrey, F. J.; Lucas, George; Lyle, James; Lyons, C. J.; Mclanahan, E. B.; McGonagle, Chas. ; McIntyre, H. E.; Mackintosh, Rev. A.; Magoon, J. A.; May, Thos. ; Mott-Smith, E. A.; Nakuina, M. K.; Nolte, H. J.; Parke, W. C.; Peacock, W. C.; Pearson, Arthur W.; Pond, Percy M.; Potter, Geo. C.; Rhodes, C. L.; Robinson, M. P.; Rodgers, Dr. C. T.; *Ropert, Rev. F. G., Bishop of Panopolis; Rowell, W. E.; Schaefer, F. A.; Schmidt, H. W.; Searle, J. C.; Sedgwick, T. F.; Smith, G. W.; Smith, Henry; Smith, Walter G.; Smith, W. O.; Stokes, John; Swanzy, F. M.; Timmons, L. D.; Towse, Ed. ; Thrum, T. G.; Thurston, L. A.; von Holt, H.; Walker, T. R.; Wall, W. E.; Waterhouse, H.; Weaver, P. L.; Westervelt, Rev. W. D.; Whiting, W. A.; Whitney, Dr. J. M.; Wichman, H. F.; Wilcox, A. S.; Wilcox, C.; Wilcox, G. N.; Williams, H. H.; Wilson, W. F.; Wodehouse, E. H.; Wood, Dr. C. B.; Wood, Edgar; Wundenberg, F.
Ka Nupepa Kuokoa, Buke XLI, Helu 26, Aoao 1. Iune 26, 1903. THE AHAHUI KAMEHAMEHA ELECTS ITS NEW OFFICERS. 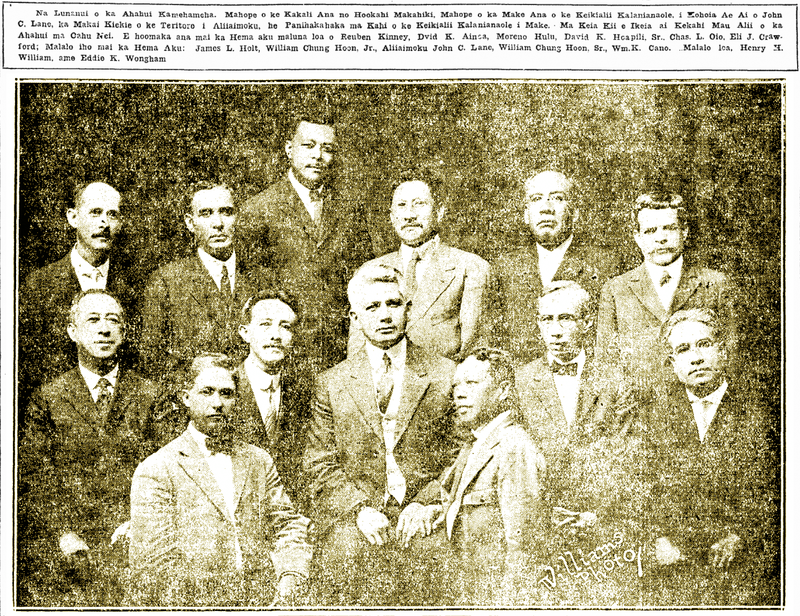 J. K. Mokumaia, Kaukau Alii; William Punohu, Lau Alii; William Chung Hoon, Jr., Kuauhau; Edward Wongham, Aipuupuu; Edwin Kea, secretary; Joseph Akina, Kuhikuhipuuone; Henry Kelii, Pukaua Nui; David Kamai, Pukaua Iki; Sam Manu, Kiailoko; Sam Williams, Kiaiwaho; Board of Trustees, William Ahia, Henry Williams, and Judge Jack Desha, Oscar P. Cox, Kahuna. The Kamehameha Secret Society is an Organization established in the year 1903 by some leading Hawaiians of the land, and from its beginnings until today, its continued strength is seen yearly. This Association is the one Prince Jonah Kuhio Kalanianaole was the head of, as the Alii Aimoku, from its inception until he left this life. Ka Nupepa Kuokoa, Buke LXI, Helu 19, Aoao 4. Mei 11, 1922. 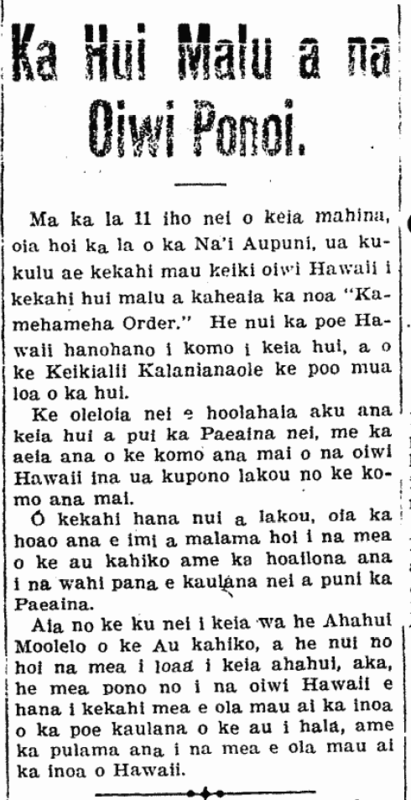 More on officers of Ahahui Kamehameha, 1923. After waiting a whole year after the death of Prince Kalanianaole, the Aliiaimoku of the Ahahui Kamehameha [Royal Order of Kamehameha], John C. Lane was chosen the replacement to fill his hole, so that he is the present head of the Ahahui Kamehameha until his replacement is elected sometime in the future when the officers are chosen. John C. Lake was chosen aliiaimoku on the 29th of January, and in other words, he is the head of all of the chapters who are members of the Ahahui Kamehameha. In that meeting that was held, it was decided that the organization would hold regularly every year, a day of remembrance for Prince Kalanianaole, the one who organized and established the Ahahui Kamehameha from when he was very young until it became the hugest of all Hawaiian organizations. On this year, the 25th of March will be the day that the Ahahui Kamehameha will remember Prince Kalanianaole, by holding a prayer gathering at Kawaiahao Church, and invitations were sent to the other Hawaiian organizations of this town to join along in this gathering of remembrance. For that meeting of remembrance, it is hoped that all the Hawaiian organizations will wear their uniforms, and in the afternoon of that day, the Ahahui Kamehameha will hold a party with all of the officers in attendance, and they will all eat as one of the foods prepared. Up until this time, the main islands of Hawaii nei have all established their own chapters; Maui was the last island to join as a chapter in this organization, this past December. To increase the membership of the Ahahui Kamehameha, it will be the duty of the members of this organization to search out and find new members here forth, with no confusion as to the number of new members that are to join. The Ahahui Kamehameha on Kauai is the Ahahui Kaumualii, with its membership reaching about 200, and A. G. Kaulukou is the Mamoalii. The organization on Hawaii Island is called Ahahui Mamalahoa, and William H. Beers is the Mamoalii. The Ahahui Hawaii is the name of the organization here on Oahu, and B. N. Kahalepuna is the Mamoalii, with its membership of 250. 1. Aliiaimoku, Prince Jonah K. Kalanianaole (deceased). 2. Alii, Dr. George H. Huddy. 3. Officers of the Ahahui Kamehameha. B. N. Kahalepuna, Mamo Alii; James H. Boyd (deceased). 4. Alii, Abraham Fernandez (deceased). 5. Alii, Charles H. Rose; 6. Alii, Carlos A. Long; 7. Alii, George E. Smithies (deceased); 8. Alii, Nagaram Fernandez (deceased). 9. Alii, James L. Holt; 10. Alii, David Kanuha; 11. Alii, Charles L. Oio; 12. Alii, John K. Kamanoulu. 13. Aliiaimoku, John C. Lane (replacement for Prince Kalanianaole); 14. Alii, Moreno K. Hulu; 15. Alii, Joseph K. Kanepuu (deceased); 16. Alii, William Chung Hoon. 17. Hope Aliiaimoku, William Chung Hoon, Jr.; 18. Alii, Edward K. Wongham; 19. Alii, Andrew I. Bright; 20. Alii, David K. Hoapili, Sr.
21. Alii, Eli J. Crawford; 22. Alii, Reuben Kinney; 23. Alii, Henry H. Williams. 24. Alii, Stephen L. Desha, Sr.; 25. Alii, George L. Desha, Sr.; 26. Alii, Samuel K. Pua. 27. Alii, J. Mahiai Kaneakua; 28. Alii, Nicholas K. Hoopii. J. K. Mokumaia, Kaukaualii; William Punohu, Laualii; Edward K. Kea, Kakaolelo; William Chung Hoon, Jr., Kuauhau; Edward K. Wongham, Aipuupuu. Oscar P. Cox, Kahuna; Joseph H. Akina, Kuhikuhipuuone; Henry Kelii, Pukaua Nui. Samuel K. Kakelaka, Pukaua Iki; Samuel Manu, Kiai Loko; Samuel M. Williams, Kiai Waho. Board of Trustees—William Ahia, Henry H. Williams, J. R. Desha. William H. Beers, Mamo Alii; Stephen L. Desha, Sr., George L. Desha, Sr., and Samuel K. Pua. A. G. Kaulukou, Mamo Alii; John Hano, Kaukaualii; I. K. Kaauwai, Sr., Laualii. S. K. Kaahu, Kakaolelo; Henry Blake, Kuauhau; W. O. Crowell, Aipuupuu; H. W. Waiau, Kahuna. Samuel Keliinoi, Kuhikuhipuuone; John Naleimaile, Pukaua Nui; E. C. Lovell, Pukaua Iki; F. W. Akana [? ], Kiai Loko; David Pele, Kiai Waho. The Alii:—J. Mahiai Kaneakua, Nicholas K. Hoopi. W. E. Bal, Sr., Kaukaualii; Clem Crowell, Laualii; Frang K. Kalua, Kakaolelo; C. F. N. Rose, Kuauhau; Charles Wilcox, Aipuupuu; Stephen Lake, Kahuna; William Hoopii, Kuhikuhipuuone; George Kauwenaole, Pukaua Nui. J. Hiona, Pukaua Iki; M. Ross, Kiai Loko; W. Cockett, Kiai Waho. Executive Committee—S. E. Kalama, Guy Goodness, W. F. Kaae. Ka Nupepa Kuokoa, Buke LXII, Helu 7, Aoao 3. Feberuari 15, 1923. Royal Order of Kamehameha officers, 1923. The Officers of the Ahahui Kamehameha. After Waiting for One Year After the Death of Prince Kalanianaole, John C. Lane, the High Sheriff of the Territory, was Elected as Aliiaimoku, the Replacement for the Deceased Prince Kalanianaole. In This Picture, Several Alii of the Ahahui of Oahu Nei Can be Seen. Starting from the Left top: Reuben Kinney, Dvid [David] K. Ainoa, Moreno Hulu, David K. Hoapili, Sr., Charles L. Oio, Eli J. Crawford; Next row down from the Left: James L. Holt, William Chung Hoon, Jr., Aliiaimoku John C. Lane, William Chung Hoon, Sr., William K. Cano. All the way on the bottom: Henry H. William and Eddie K. Wongham.